Videogames are entertaining and make for great stress relievers, but if Seattle's GameSave event goes as planned, they might also save lives. Remember that huge earthquake that struck Japan in March? The devastation and loss of human life was on a scale normally reserved for war zones, owing primarily to the fact that a quake of that size was borderline unimaginable to the vast majority of its victims. Despite all our modern science and technology, humans panic when the very ground under our feet rebels against us. That's why it's crucial that communities be educated on what to do in the event of a disaster prior to it actually occurring. 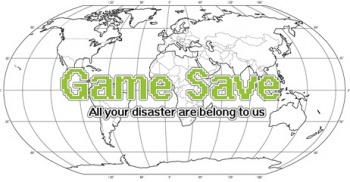 Enter: GameSave, a Seattle-based gathering of developers, hackers and emergency response personnel with the goal of creating games that can teach people disaster relief techniques that may save lives in the event of a cataclysmic emergency. The idea is the brainchild of Gameranx lead editor Annie DennisdÃ³ttir Wright and Willow Brugh, an employee of Geeks Without Bounds, a "not-for-profit alliance of hackers, coders and geeks united by the common goal of assisting communities in distress." During a recent discussion of the "games can be more than just entertainment" ideals espoused by gamification advocate Jane McGonigal, the two ladies wondered how games might be put to use in helping victims like those they'd seen in the recent Pacific Rim earthquakes. Initially Wright and Brugh envisioned the creation of a single game, but quickly realized that the competitive spirit of multiple development groups could be leveraged toward making multiple games each covering multiple aspects of the project's potentially life-saving educational material. Thus the GameSave concept was born as a traditional five-week "hack-a-thon," gathering teams of developers to hack together the most useful software possible. It remains to be seen if GameSave will actually achieve its lofty goals when the event kicks off in late June, but if the optimistic support the project has already attracted (including praise from White House tech guru Thomas Kalil) is any indication, this is definitely a project to keep an eye on. If you're interested in learning more about GameSave, or would like to actually enter the hack-a-thon yourself, you can find full details at the event's official website.